I am trying to increase the metal forces for use in my display games at Napoleonic re-enactment displays. This project is to replace the wooden blocks that I originally made for my home-grown game “Est-il Hereux?” with metal stands of 6mm miniatures. 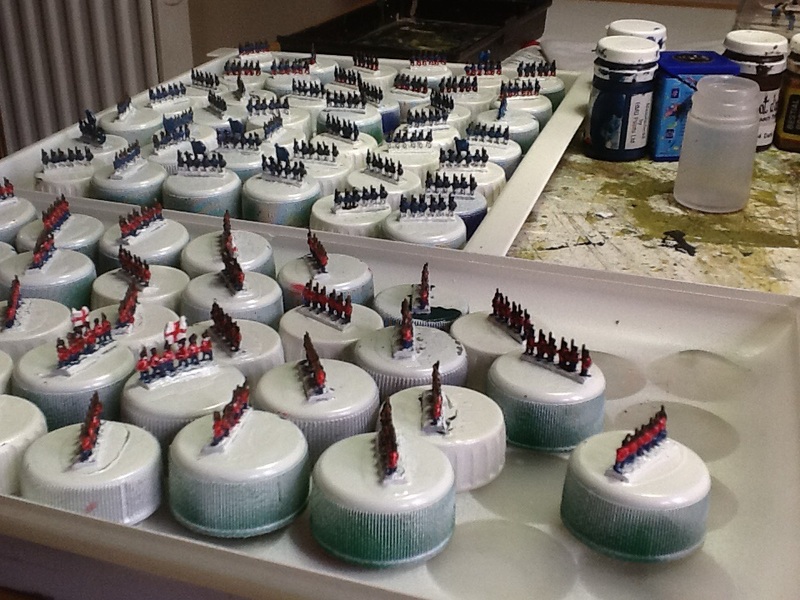 I am currently working my way through a couple of hundred line infantry for Red Army and Blue Army and finding it a chore. Although the uniforms are very simplistic, toy soldier like, this batch has given me several headaches. First I managed to apply the white spray painted undercoat too thickly and it has filled the gaps between the legs of the soldiers and obscured some of the other detail. It has also come out with a glossy finish on the metal figures, even though some hard plastc figures sprayed at the same time have a matt finish! This means that the red and blue acrylic paint is not taking well and most figures need at least two coats to get a proper covering. It does not help that I over-thinned the red paint before application. First basic covering. Much touching up to be done.